New season means it's time to take part in a new seasonal nail art challenge. 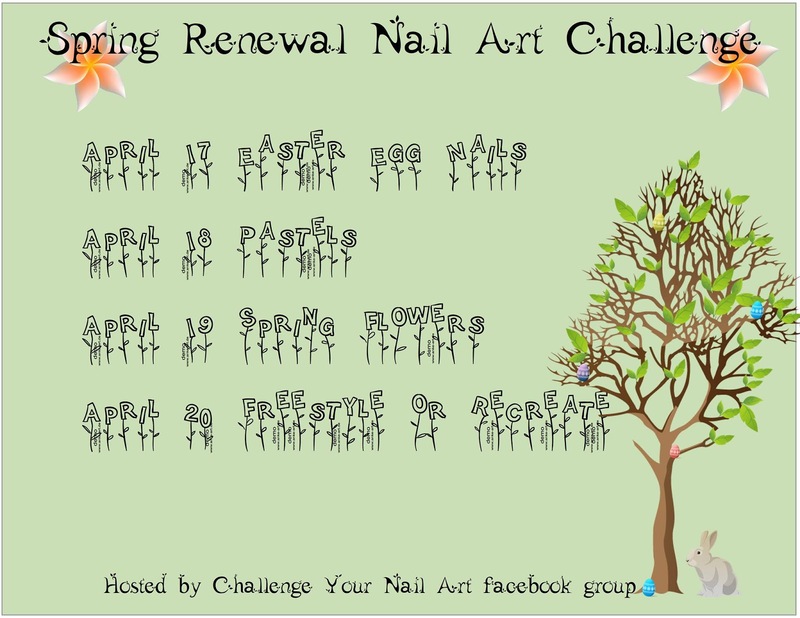 :) This challenge is called the Spring Renewal Challenge, and it's themed around Easter and spring. The topic for today: Easter Egg Nails! Rather than doing traditional designs I went with an abstract 'cracked egg' look, and I'm really happy with how it turned out. Take a look below for more pics and info! When I thought of what I wanted to do for this theme my first thought was to do what a lot of other people are doing: zig zags and dots and other designs that you would find on eggs. Been there, done that. I decided I wanted to do something different so I decided to work with the idea of a cracked Easter Egg instead. Guess my eggs fell out of the basket before they could be hidden (and one even seems to have fallen out before it could be dyed)! To get this look I used all four of the OPI Sheer Tints on top of two coats of Sinful Colors Snow Me White, and then topped that with a coat of Julep Hermione. For my accent nail I skipped the tinted layer and just put the white crackle on top of my glossy white polish to give it a dual-textured look. :) I think crackle polish has a bad rep these days, and I don't know why since I think it's a really fun accent to use in designs once in a while. Now that I've used the Sheer Tints in this way I like them a whole lot more. I just brushed on all the shades in various places on my nails (which was super quick to do) and made sure to overlap the colours here and there. When I smoothed the whole thing with a topcoat before applying the crackle it made sure everything was nice and blended and even. Totally going to be playing around with these some more. All images depicted here and elsewhere on my site (unless indicated) are my intellectual property and Copyright © ProcrastiNails 2013. Please do not link/re-host elsewhere without asking. What a great idea for this theme! It looks great and its something different from all the other Easter eggs designs I've seen too. 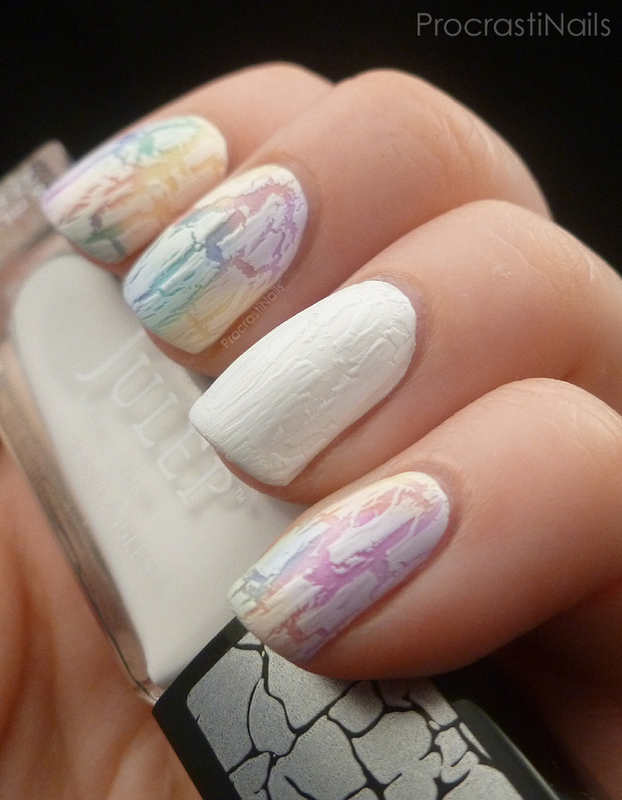 I love how soft your pastels are and the white on white crackle gives an amazing effect - big thumbs up from me! 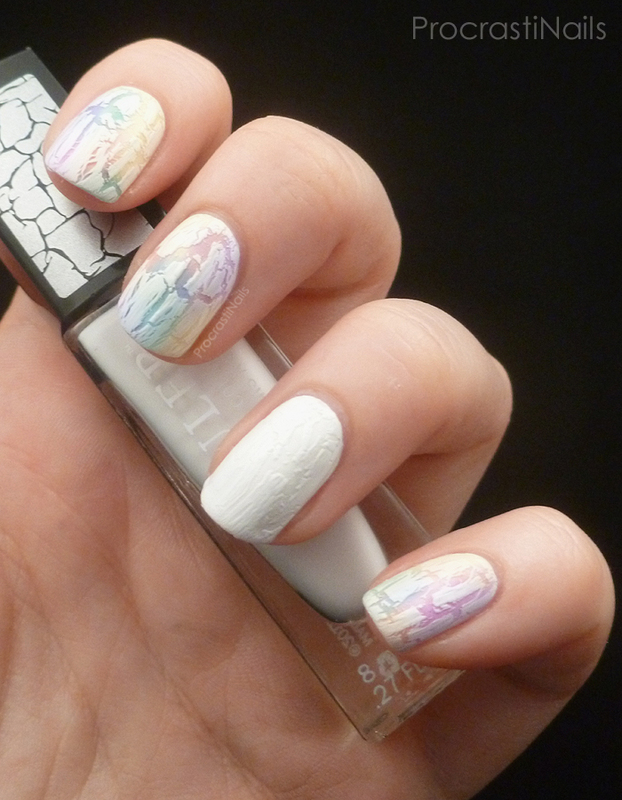 (I have always had a soft spot for a good crackle mani though!). 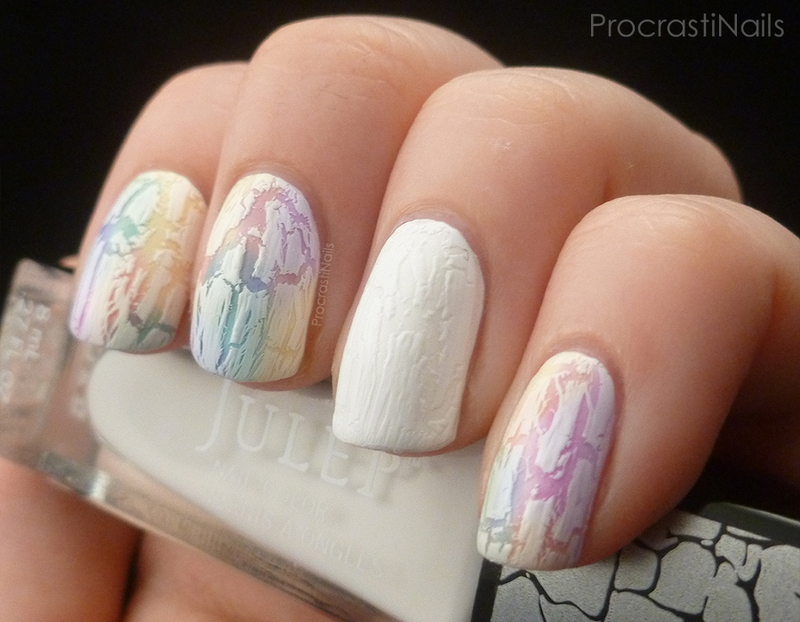 I never would have thought to use crackle like this, but these turned out SO COOL! I really love these! What a great use for crackle polish and the sheer tints. So pretty! I can't wait to ge my hands on those OPI sheer tints. You did a great job with them and I never would have thought to use my crackle polish for this but I love the look. Very creative, way to think outside the box! I love how you interpreted the theme, and the colors are gorgeous! 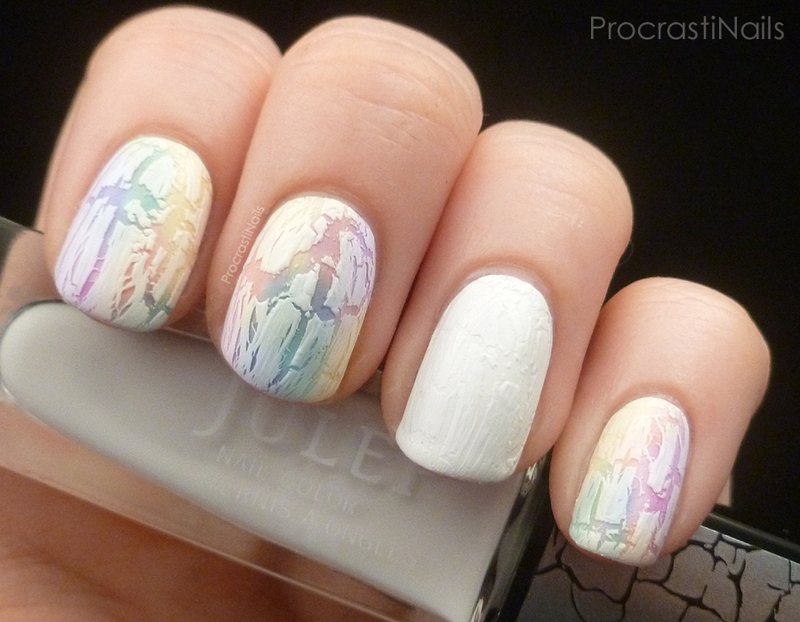 This makes me so happy, ha, that you found such a great way to use a crackle polish. You're right, they don't seem to be all that favoured anymore; shame, really, as they're so much fun, I still think. Great look you created with these. Let's look inside my nail care bag!